The Pile Driving Analyzer® (PDA) system is used for Dynamic Load Testing of any type of deep foundation (ASTM D4945) and for Pile Driving Monitoring. It assesses the capacity of several deep foundation elements, driven or cast-in-place, in a single day. PDAs also evaluate shaft integrity, driving stresses and hammer energy when monitoring installation of driven piles. PIT performs Low Strain integrity testing, also called Sonic Echo or Pulse Echo Testing. The PIT may be used for auger cast-in-place piles and timber piles. It detects potentially dangerous defects. The Pile Integrity Tester evaluates concrete or wood foundations for the presence of major cracks, voids, or reductions in diameter, following ASTM D5882. The Cross-Hole Analyzer determines the quality and consistency of the concrete of drilled shaft, slurry walls, bored piles, cast-in-situ piles and other type of concrete foundations. The pile is tested by applying a direct load as specified on the test pile where the load comprising of a Kentledge and concrete blocks (weighing 2.4 or 4.8 tons each) is brought to bea on the pile through 1000MT hydraulic jacks as per the load to be tested. The kentledge is prepared using steel girders of 600 mm x 800mmand 12-meter lengths. 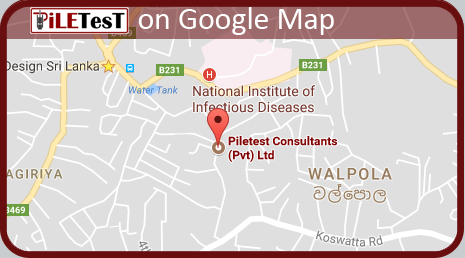 PileTesT Consultants (PVT) LTD was incorporated in Sri Lanka specifically to provide the dynamic pile testing services and geotechnical engineering services with high level competent professionals. The company was certified for ISO 9001: 2015 which was accredited by SLAB and RvA Netherlands. The company, with its competent technical staff and state of the art equipment, is committed to providing quality services. It also enjoys the backing of Pile Dynamics Inc., USA, the pioneer and manufacturer of the Pile Driving Analyzer®. In addition, the Company provides expert geotechnical solutions and recommendation through eminent professional in this field. The company has been enjoying immense growth since its inception and has successfully completed large number of projects for government and private sector organizations, including some land mark projects. Our scope of services has expanded over the years to meet the ever evolving needs of our clients, such as settlement monitoring, lateral displacement monitoring using inclinometers, testing instrumented piles, vibration monitoring, crack monitoring and field and laboratory geotechnical testing etc.,. Act as an independent quality assurance testing agency. Use of state of the art measuring techniques complying with relevant codes and specifications. Be conscientious in our work and always punctual.